I have passed Vidigal dozens of times, driving along the Avenida Niemeyer between Leblon and São Conrado, and I have met many people who live there – the Vidigal population provides much of the labor for store and domestic duties in Zona Sul – but I never imagined actually going up into the favela community. I do translations and voice-overs, and I was recently given a fascinating text about a huge machine that goes out into the sea and cuts up sunken wrecks. The text is from a video that will be shown in an event in São Paulo where people go who like cutting up wrecks, and presumably building ships as well, or maybe looking after ports, as this particular ship sank in the middle of Santos harbor and was preventing port expansion. I translated the text and was told that the voice-over would be recorded in a studio in Vidigal. Vidigal? 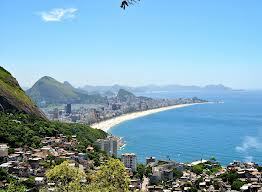 I exclaimed – I have to go into Vidigal? 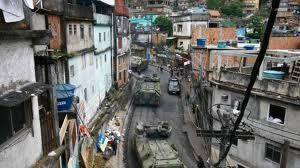 Well of course with the UPPs the favelas – or communities as we are supposed to call them nowadays – are much safer, and apparently Vidigal was always pretty safe, for its residents and visitors – after all, it was once visited by the Pope! So a day was set and I asked about getting there. ‘Come by car’, they said, ‘though as you live in Gavea you could walk it’. I asked about parking – no problem! My contact said he would meet me at the entrance, and show me where to go. I reckoned it must be somewhere around that praçinha with the amphitheater. Well, at the appointed time he met me, got in the car, and directed me – up … Thank goodness we weren’t walking it, I would never have made it. The views are of course amazing. Not expecting to go so high, I had not taken my camera, but will certainly go back one day to capture the views of the ocean, the favela itself, and in the distance the beaches of Ipanema and Leblon.